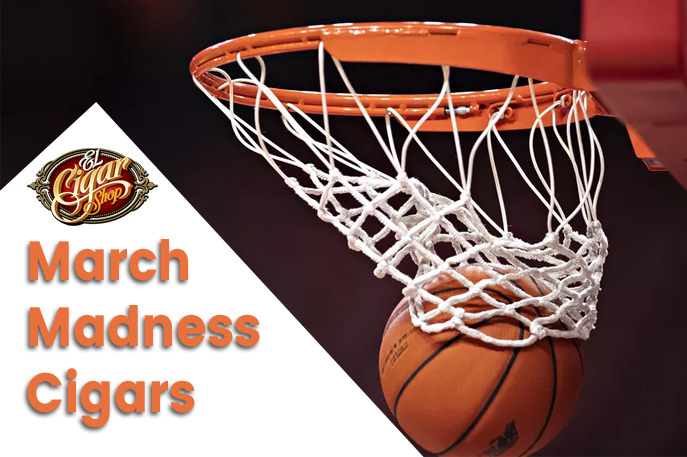 Take a look at some of El Cigar Shop’s college basketball-inspired premium cigars to smoke during March Madness. We'll have to be content looking at that blank bracket until the full 2019 March Madness field of 68 teams is revealed on Selection Sunday, which is scheduled for March 17th. Meanwhile, let’s take a look at some of El Cigar Shop’s premium cigars to smoke during the madness. Arturo Fuente Anejo Reserva is a power forward and full-bodied cigar. The strong blend is rolled with the finest proprietary Dominican filler and binder from Chateau de la Fuente into a five-year-old Connecticut Maduro wrapper that is aged in oak Cognac barrels. The process produces big and bold flavors of spice, cocoa, sweet cream, nuts, and the oak and Cognac from the barrel. Arturo Fuente Anejo Reserva will definitely land in your Final Four! This large ring Nicaraguan Puro is a spicy blend attributed to the dark Habano wrapper and aged Cuban-seed long-fillers. Along with the spice, there are notes of espresso, cocoa, and premium Nicaraguan tobacco. Fans of large gauge cigars will go mad for the Asylum 13 Habano. The Filthy Hooligan is a limited St. Patrick’s Day release. The St. Patty’s Day classic is uniquely rolled barber-pole style with a dark Nicaraguan Jalapa blend that is interwoven with a shamrock-hued Honduran Candela wrapper encompassing Ecuadorian Sumatra binder and filler from Panama and Honduras. Notes of grass in the first quarter, while coffee notes move into half-time, joining the pepper and cream in the third. It’s a slam dunk! At El Cigar Shop, it’s Macanudo Madness! The Macanudo Hampton Court Café sports a silky golden Connecticut Shade wrapper enclosing Mexican San Andreas binder and Dominican Piloto Cubano and Mexican long-fillers. The Court Café delivers mild but classic creamy flavors and sweet aromas. Macanudo Hampton Court Café is as smooth as a basketball court. In 1964 UCLA beat Duke 98-83 in the NCAA University Division Basketball Tournament. UCLA has won more Tournaments than any other team, a total of 11, 10 of which came in a span of 12 years from 1964 to 1975. UCLA’s coach was John Wooden, considered to be one of the most revered coaches in sports history, even being nicknamed the “Wizard of Westwood”. That said, the “Wizard of Miami”, José Orlando Padrón, evokes the aroma and image of some of the best cigars in the world. To celebrate their 30th Anniversary, the Padrón Family released this extremely limited production line in 1994. Padrón 1964 is a box-pressed beauty with notes of roasted coffee, cocoa, pepper, and a touch of fruity sweetness. This cigar is certainly a champion. The Partagás brand is Cuban cigar royalty and its crown jewel is the Partagás Lusitania (Former North Carolina Tarheel, Michael Jordan, is a fan). An alternative to the iconic cigar is the Partagás Legend Fabuloso Leyenda. The blend has been expertly crafted with a Connecticut Broadleaf wrapper intermingled with meticulously aged Dominican and Honduran Olancho San Agustin leaves. The result is a layered, nuanced collection of flavors with pleasant notes of cocoa and earth. Like Jordan, himself, Partagás is a Legend. A true Honduran Puro, Mayhem Corojo consists of Christian Eiroa proprietary Corojo-seed from the family’s farm in the Jamastran Valley in Honduras. The Corojo wrapper provides a spicy profile teeming with savory robust flavors of malt, pepper, and a slight saltiness. The Corojo leaf lends complex, well-balanced robust flavors to this incredible smoke. Medium to full-bodied, Wynwood Hills Mayhem Corojo is a premium cigar you will enjoy on or off the court. Enjoy these and other cigars at insanely discounted prices online at elcigarshop.com and good luck with your bracket! Go ‘Nova! To buy cigars online, browse through our huge collection at El Cigar Shop!